First announced at the Six Invitational, Pick and Ban will change the selection process of Operators in a match and will bring a variety of new strategies to competitive Rainbow Six. 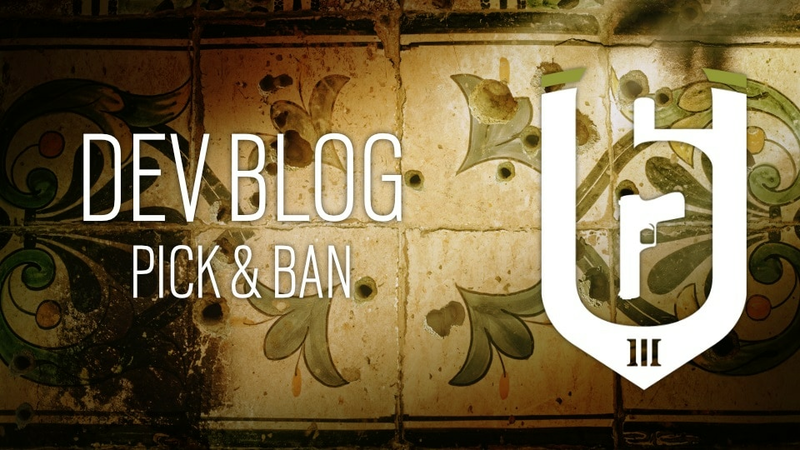 Pick and Ban will be introduced into custom game options with the launch of Year 3 Season 2, and it will be a highlighted feature during Rainbow Six Pro League Season 8 and officially supported competitive events. While it was available on the latest Test Server, we wanted make sure all the details are covered. What is Pick and Ban? The Pick and Ban is a new game flow that players can activate when creating a custom game. At its core, Pick and Ban is a competition-focused feature that introduces a banning mechanic in which up to two Attack and two Defense Operators become unavailable for the entire duration of a match. The goal of this feature is to deepen the strategy of the game by altering the pool of Operators available in a match allowing players to craft their own Meta. For instance, if a particular Operator is considered a challenging threat, this puts power into the hands of the players to create a strategy that works for them. We also intend for the Pick and Ban to allow the team to counter their opponent’s strategy. A team may decide to ban an Operator, not because they are strong, but because the opposing team plays that Operator better. First, you need to create a custom game, and then navigate to the match settings section of the custom game options. From here, you can activate/deactivate the ban feature. You will also need to select the time per ban phase. To mirror the Pro League settings, you will also want to activate 6th pick, and select the time for this pick phase. Finally, set the objective rotation to rounds won. The Ban order is set to prevent the team that will play on one side first to lock pairs of critical Operators for the other side. For example, the team that starts in Attack will always have the second Attack Operator ban, and the Defenders will always have the second Defending Operator ban. There is a possibility that both Hibana and Thermite could be banned for an entire match, but we feel that there is a certain strategy and balance to this. The team that will ban the second breacher will start on Attack and face a difficult challenge for the next five rounds, allowing the enemy team to build momentum. If they have a specific strategy in mind that does not involve metal breachers and believe they can win rounds without them, then it could be a valid strategy. However, both teams can only ban one Operator per side, so no team can force a no metal breacher Meta on their opponent. Note that while Operators are banned for the entire duration of the map, the pick phase is still done for each round. After the Ban Phase, the Attackers will select their spawn, and Defenders will select their bombsite. Both teams will select their Operators after the spawn and site selections have been made. Not much has changed here, but teams will be able to select their Operator knowing where they will be defending or spawning for Attack. Following the Pick Phase, all Operators are revealed to both teams making every player aware of the team composition of their opponent. Following the Reveal, each team can activate a Sixth Pick, which is the possibility to re-pick one of their Operators. This Sixth Pick is oblivious to the enemy team, as they do not know if an Operator has been swapped out, let alone which one. Quick thinking and good decision making is key in Sixth Pick, as players will want to misinform opponents, while trying to understand their strategy. Bluff, adaptability, diversity are all key part of this process. For esports settings, there will be five Attack rounds in a row and five defense rounds in a row. Teams will not switch back and forth between Attack and Defense. First team to win six rounds will win the match. Both teams will still be required to win a round on the opposite side. Therefore, this is more of a flow change than a major gameplay change. For example, if teams trade Attack rounds back and forth, the first team to win a Defense round wins the match. The same is true with this new round rotation. The new round rotation should be less confusing for our viewership, as teams will not swap side every round. Similarly, this should allow teams to adapt their strategies on the fly without needing to switch their mindset from Attack to Defense each round. There are two options for Objective Rotation: Play, and Win. Play is the current implementation where if a team wins an objective, they must play X number of rounds on other objectives to be able to play it again. Win is an alternative ruleset where if a team wins an objective, they must win X number of rounds on other objectives to be able to play it again. Losing on other objectives does not unlock the objective won previously. With the new style of Objective Rotation, named Rounds Won, teams will be required to win a given number of rounds on other bomb sites prior to returning to the site they won on previously. This will prevent teams from simply playing out rounds and taking the loss before returning to a bombsite they have won on previously. Stay up-to-date on all the latest information on Operation Para Bellum on rainbow6.com, and follow Rainbow Six on Twitter and Facebook.